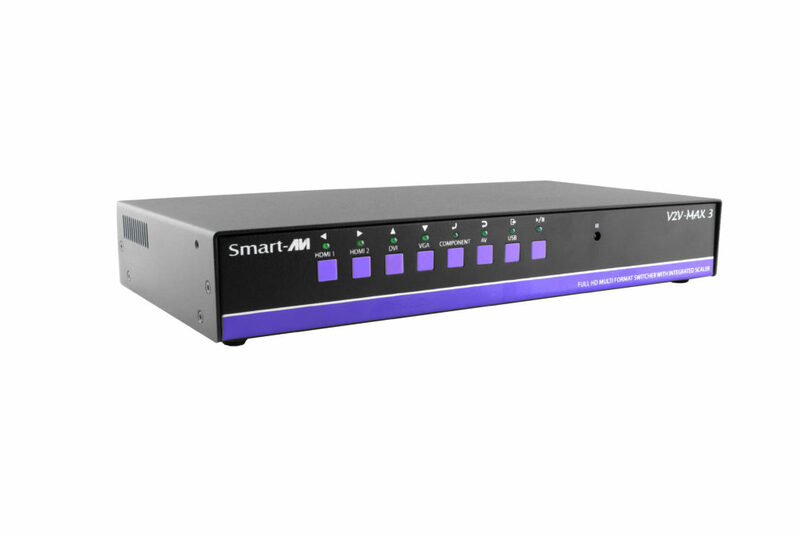 SmartAVI's V2V-Max 3 is an 8-port switch that offers DVI, VGA, Y/Pb/Pr, Composite, USB, HDMI, RS-232, and IR support. 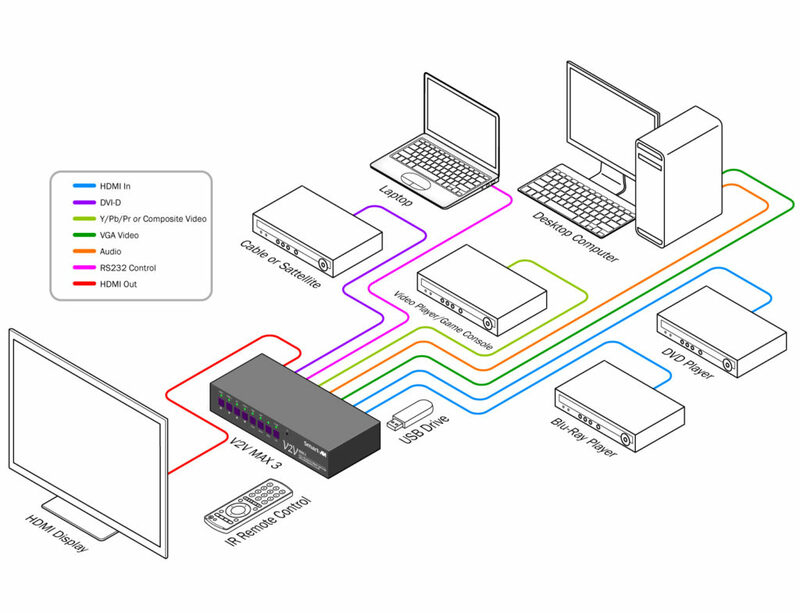 The V2V-Max 3 connects to various HD video sources, including VGA, DVI, HDMI, composite, and USB sources. It is capable of high resolution 1080p (1920x1080) output via HDMI, perfect for HDTV and computer monitor displays. Better yet, the V2V-Max 3 is plug-and-play ready, ideal for users of any technical skill level. 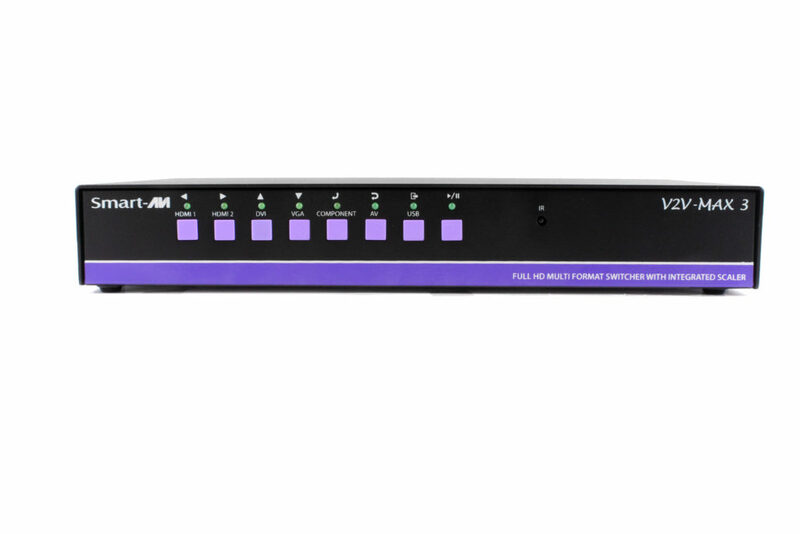 The V2V-Max 3 is great for presentation settings of all kinds, thanks to its easy scaling and converting features. It takes incoming video feeds and automatically optimizes the signal for high definition output on HDTVs, making it an all-in-one fix for outdated video equipment and lower resolution imagery. The V2V-Max 3 makes a great addition to AV set-ups in schools, retail stores, office buildings, restaurants, and home entertainment systems; if aging video equipment isn't getting the job done, V2V-Max 3 will make certain it is done right! Tactile Front Panel Buttons: Easy to read and use front-panel buttons make switching between video sources easy! Infrared Remote Control: The V2V-Max 3 comes with a V2V-MXR remote control that makes switching and scaling convenient! RS-232 Commands: Send commands directly to the V2V-Max 3 via RS-232 on a computer.